Every store owner in Brooklyn New York will tell you, that when the Store Front gate is not working, it can cost a lot of money, not to mention the time and the fact that sometime there is nothing you can do, and only a professional Store front gate repairman in Brooklyn New York can solve the problem. You may be using a roll up gate, a rolling door, a see through gate or a roll down door for your store front in Brooklyn, but the truth is that when the gate or the door is stuck, you are going to have to wait for a store front gate expert to come and fix it for you. Before we will start explaining about the different types of store front gates or store front doors in Brooklyn, we would like to warn you that a stuck store front gate is something that should be fixed by a trained technician, and trying to repeatedly open or close the gate can result with a deeper damage, and can even be dangerous in some cases. And since we offer same day store front gate repairs in Brooklyn New York, you just need to give us a call, and we will fix your broken gate today. This is the most common problem that we need to deal with during our store front gates repairs in Brooklyn New York. The thing is that people usually wait until the store front gate is completely stuck, and they cannot use it anymore, before they contact us to come and fix their store front gate. The problem is that now the gate is completely stuck, and what you need is an emergency store front gate repair in Brooklyn. If you wouldn’t have ignore the problem when it just started, and called us when you noticed that there is something wrong with your store front gate in Brooklyn, we could fix the problem before the gate got stuck. That could save you both the time of waiting for us to come and fix it, and the repair would probably cost you a lot less. From our experience in repairing store front gates in Brooklyn, we can say that problems do not disappear, but just get worst. A simple problem with a loosened spring, which can be fixed within minutes, can turn into a massive damage when it is being ignored. And in most cases when it comes to store front gate repairs in Brooklyn, is that the store front gate operator is the next to break, because it was being used on a store front gate which isn’t operating smoothly. What not to do when the store front gate is stuck? What you shouldn’t do is to try and push the gate, or try to force it to work. If your store front gate in Brooklyn is not moving, there is a reason for that, and it has nothing to do with force. Every store front gate in Brooklyn should be operating smoothly, and if you find that you need to use force, get someone to fix the gate. The store front gates in Brooklyn seem simple to repair, and when you were used to a store front gate that open and close every time, and in many stores few times during the day, when the gate get stuck, you may think that operating it once more will solve the problem, but what you don’t know is that forcing a store front gate in Brooklyn to work is usually the worst thing to do. Who fix store front doors in Brooklyn? When you need someone to fix your store front gate in Brooklyn, you are not sure who exactly you should contact, do you need a locksmith in Brooklyn? Do you need an electrician? Do you need someone who do Iron works in Brooklyn? And to help you answer the question “who fix store front gates in New York? We wrote this article. 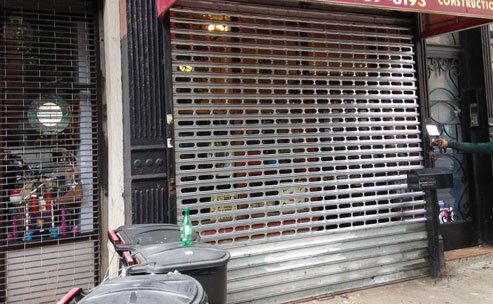 We offer service for all aspects of store front gates repairs in Brooklyn New York. If you need store front gate operator repair or installation, out of track gate repair, or even if you need overhead door repairs in Brooklyn New York, we can help. Because we believe that when you want to become a pro in what we do – and in our case it is store front gates repairs in Brooklyn – you must love what you do, and you must be able to provide solutions to all aspects of your job. Which store front gate in the best in Brooklyn? If you are asking what type of gate to install, we can answer that it is deepened on your needs, and what is the purpose for installing a store front gate. But there is one tip that we love to share, and it work for all kinds of store front gates in New York. Whether you need a roll up door repair in Williamsburg New York, or a garage door installation in Bronx New York, you should always aim and look for quality, in both the store front itself, and for the person who perform the installation for you. You need to understand that the store front gates Brooklyn Garage Doors And Gates install are from the kind that stay strong and look new even after 30 years (As long as you make sure to maintain them on time like every store front gate in Brooklyn should). We believe that quality may cost more in the beginning, but when you look at things from a perspective of 30 years, you know that when you invested in quality, you got great return for your investment. If you need proof for the quality of our garage doors and store front gates services in Brooklyn, we welcome you to visit our Yelp page, or check out our Google plus page, and read reviews written by customers in Brooklyn New York who used our repairs and installations services, and were 100% satisfied with results. Do I need a store front gate operator? What is the size of my store front gate in Brooklyn? How often am I going to use the store front gate? Who will use the store front gate? Do I have the budget to motorize my store front gate? Is it even possible to motorize the store front gate? Was there a motor installed before? What is the condition of my store front gate? This is just a partial list, and a meeting with one of our store front gate spec lists in Brooklyn can help you make the right decision, if to install a new store front gate operator, or to use the gate manually. Why it is suddenly difficult to open my store front gate? There is no one magic answer to that question, and from our experience, the reason can be a combination of many things, but usually the problem is due to a problem with the spring of the gate. After many years, and especially if you have been ignoring the need to grease the store front gate in Brooklyn, the store front gate spring can get weak, and it cannot support the weight of the gate like it used to. In that case, you will need to contact us for a same day service in Brooklyn, and we will add tension to the fate, grease it, or in some cases of broken store front gate spring in Brooklyn, we will replace the spring and install a new one. Why my store front gate doesn’t remain open anymore? The solution to that problem is the same as the solution to the store front gate in Brooklyn that you find hard to open. The store front gate spring is designed to fit your gate in a way that will keep the gate open or make it easy to lift it. If your store front gate in Brooklyn used to stay open, but now it is dropping and falling down, call us for same day rolling gate repairs in Brooklyn New York. Sometime you put the key in the key switch to open or close your store front gate in Brooklyn, but nothing happen. 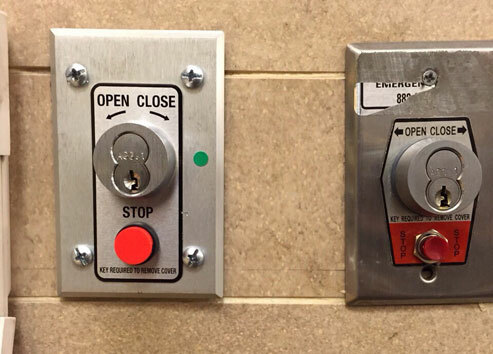 The solution to this problem depend on the reason that stop the Key Switch from triggering a response from the gate operator. But there is no need to worry, Key Switch installing is something we can easily repair, and we carry with us Key Switches for all store front gates in Brooklyn New York. Whether you need a new Key Switch for a roll up gate in Brooklyn, or a key switch repair for roll up gate in NYC, we can provide you with the best solution today. Let’s make it simple, if your store front gate in Brooklyn jumped out of tracks, there is a reason for that. A store front gate doesn’t just jump out of tracks for no reason, and this reason need to be addressed as well during the process of bringing the door back into the tracks. You might forgot to remove the lock before opening the gate, or you may have forgot something bellow the gate and then tried to close it. But no matter if the reason for the “out of track gate” is one of the reasons we just described, or any different reason, a store front gate in Brooklyn that went out of tracks should not be operated. You need to call a store front gate specialist in Brooklyn to come and fix the gate for you, and only when the specialist will finish the job, put the store front gate back into tracks, secure it and make sure it is working again, only then you can go back to use the store front gate. The distance between a gate that went out of tracks, and just need a store front gate repairman to bring it back into tracks, and a gate that need many new parts deepened on how deep is the damage, and if you will try to use the gate – when obviously is not moving – instead of calling us for emergency rolling gate repair in Brooklyn, can be the difference between a repair that can be completed within an hour with minimal cost, and a repair that can take few hours, and that will cost you a lot more. It can be a store front gate repair in Brooklyn, or overhead door repair in Bronx New York, anyone may need emergency repair at some point. We at Brooklyn Garage Doors And Gates understand that, and we do all we can to provide a quick and efficient repair service for all kinds of rolling gates in Brooklyn. We do not limit our self to one kind of repair, or to one kind of gate, since the amount of different types of store front gates in Brooklyn is endless. It can be a grill door spring repair in Borough Park, or a commercial overhead door repair in Brooklyn, but no matter what the problem is, what day or what time of the day, we will always be there to assist you with your store front gate in Brooklyn. Any day, any time, we will be there! We offer emergency repairs for rolling gates in Brooklyn New York, so you will never have to worry about opening your business in the morning, or locking it by the end of the day. For a same day service in Brooklyn New York, contact us. We can install new garage door opener today! We can replace you garage door spring today! Same day rolling gate repairs services in Brooklyn. New garage door installation in Brooklyn from leading brands. 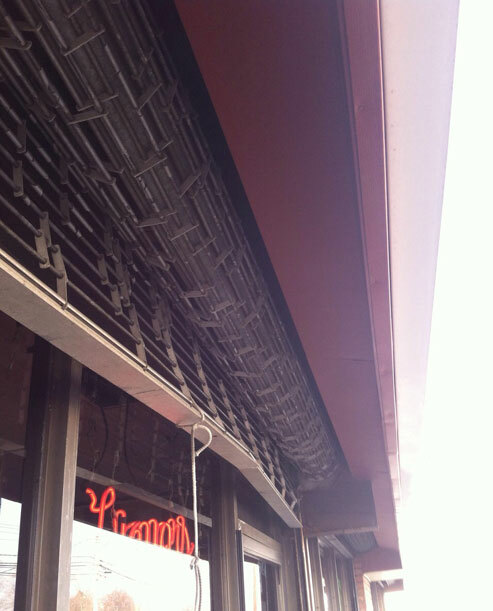 Commercial overhead door repairs and installation service New York. Copyright © 2011 Brooklyn Garage Doors And Gates. All rights reserved.